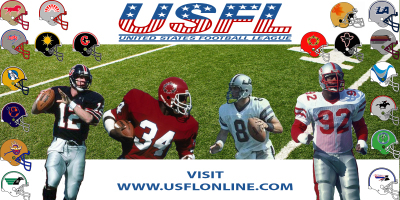 The USFL developed a loyal following in its three- year existence. The league had TV deals in place with ABC and ESPN and leases with stadiums that housed NFL teams. But if the league decided to move from the spring to the fall, stadiums like the Vet in Philadelphia would pullout of their lease agreements with their USFL tenants in favor of the NFL teams. More importantly, a fall move created a conflict with ABC -- which carried the crowning jewel of NFL programming -- Monday Night Football. With the NFL controlling the networks, the USFL never had a chance to survive in the fall without a TV contract in place. League expansion and overspending on college talent put a drain on the stability of the league as the USFL grew into 18 cities by 1985. Many teams were still losing money and the league strayed from the initial stance of staying patient and remaining fiscally conservative in signing big-name players. Generals’ owner Donald Trump was the biggest culprit – on his 1985 roster he had two Heisman Trophy winners and at least six well-established former NFL veterans on the team. But USFL owners couldn’t stay the course in the spring. Some of the millionaires -- especially Trump -- wanted to make a drive to the more traditional fall schedule and force a merger with the NFL. The NFL was considering an absorbing a few USFL teams. If this occurred, this would drastically raise the value of the few chosen USFL franchises. Einhorn's speech about a lucrative TV deals and a possible absorption of teams motivated the majority of the owners -- who saw the “dollar signs” in the fall schedule -- to switch seasons. The NFL didn’t like policy being dictated to them, they preferred to be the bully. 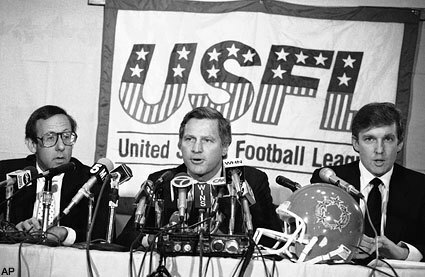 The USFL had lucrative deals in place if the league remained in the spring: ABC had $175 million on the table; ESPN was offering $70 million over three years and was prepared to televise a fall schedule by the USFL. But ABC was getting pressured by the NFL to pull-the-plug on the TV contract with the USFL, if the spring league moved to the fall. The fall move depended solely on the success of the $1.7 billion antitrust suit against the NFL. It was a star-studded trial of names: Raiders owner Al Davis, legendary sportscaster Howard Cosell, Generals’ owner and real estate tycoon Donald Trump, Senator Al D’ Mato and NFL Commissioner Peter Rozelle, were just a few of the names that took the stand in the trial that doomed the USFL. While the names of the witnesses that testified had enough money to feed Africa through the year 2050, it was the USFL’s lead counsel who stole the show -- Harvey Myerson. 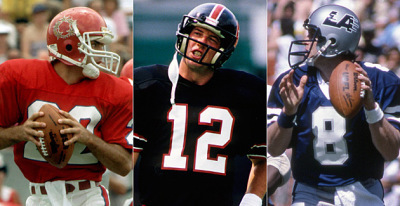 Jim Kelly (center) and Steve Young (right) made their mark on the NFL but Doug Flutie (left) was left out in the cold and forced to show his skills in the CFL.